Hope's Cafe: SFF-Plow and Hearth Cardigan Review and $50.00 Giveaway!! 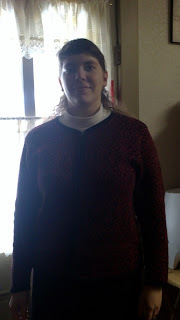 SFF-Plow and Hearth Cardigan Review and $50.00 Giveaway!! I love shopping at Plow and Hearth. They have so many neat products, in a range of categories. From kitchen tools to home decor, pet supplies to kids toys. And, of course, they have clothing and shoes. So, I contacted them about a feature during the Spring Fashion Fling, and they generously responded by sending me this lovely ladies Cardigan. It is a little heavier than my other cardigan, and is perfect for the weather we’ve been experiencing lately! I wore it to Church right after getting it, and received a few compliments :) It pairs up perfectly with my black skirt, and looks very stylish! I really like the zip-up front. It is easier than buttons, and looks pretty too. The really nice thing about this cardigan is I can wear it during the cool spring season, and pull it back out again during the fall! The red/black color is perfect for the holiday season, too! I ordered a size larger than I normally wear, since I don’t like tight or clingy sweaters. It fits great, and there’s plenty of room for an undershirt. I usually wear it with a mock turtleneck, for a really dressy look. Plow and Hearth is giving a $50.00 Gift Code to one of my readers!! Go to Plow and Hearth and tell me an item you would purchase if you won!! 1 entry-"Like" Plow and Hearth on Facebook; tell them an item you like, and that you came from Hope's Cafe! This giveaway ends Saturday, Feb. 19, 2011, at 11:59 p.m. Please leave a valid email address in each comment, as this is how the winner will be notified. Winner will have 48 hours to respond, or another winner will be chosen. Giveaway open to US residents only. Disclaimer:I was not monetarily compensated in any way for this post. All thoughts and opinions are mine. All quotes taken from the Plow and Hearth website. I like their Acorn Women's Mules. I love the bronzed rubber door mat. I have been dreaming of a gravel path around my garden, so I'd buy the EverEdge Kit! I like the Acorn Boot and Mule. i would buy the globe solar string lights! I tried and tried but could never connect to the Plow and Hearth website. I like the Personalized Quilted Tote. Please enter me. Thanks! I like the Beehive Beverage Dispenser. I would love to win! I like the Aluminum Serving Bowl. This would be great to win!